Q: An explosive device was detonated near the US Embassy in Beijing around 1 p.m., injuring the alleged bomber. The US Embassy and the Beijing police have reported the relevant information. Do you have more details? What's your comment? A: You may have noted that the Beijing police has issued information on its official Weibo account on what happened by far. I want to say that this incident that happened at the intersection of Tianze Road and Anjialou Road in the Chaoyang District is an isolated public security case. The Chinese police has timely and properly handled it. Q: The US company Qualcomm's deal to take over NXP failed because Chinese regulators did not give approval. Can you give us reasons why that deal was not approved? A: I took similar questions yesterday. This takeover case is reviewed by the relevant Chinese department in accordance with the Anti-Monopoly Law. You may refer to the relevant department for specifics. Q: According to the latest trends, Imran Khan of the PTI party seems to take a lead in the election, but we cannot confirm the results so far. There have also been allegations by the previous governing party, saying that it would reject the results because of irregularities in the election process. Do you have any comment? Are you concerned at all about the current developments? A: We are pleased to see that Pakistan has held a successful election, and sincerely hope that Pakistan will maintain political and social stability and focus on national development. The China-Pakistan friendship receives heartfelt support and acclamation of the two peoples. Whatever the result of the election is, it won't affect the development of China-Pakistan relations. The Chinese side is ready to work with the new Pakistani government for greater progress in our all-weather strategic cooperative partnership. Q: Yesterday Facebook's request to start an office in China seemed to be rejected. Can you tell us why its request to establish an office here is rejected? A: I will refer you to the competent authority for the specifics. In principle, I shall say that China's Internet has been flourishing in recent years and China has become the biggest market for Internet users globally. We are ready to share the development opportunities of China's Internet with countries around the globe. Foreign Internet companies are welcome to operate in China, as long as they abide by Chinese laws and regulations and comply with the management requirements of relevant Chinese department. Q: The deadline for the Qualcomm deal has already been passed. There is no word from the Chinese regulators after more than a year. Some investors and companies are looking at this and wondering whether China's anti-trust system is transparent and rules-based. Is this an example of China's commitment to open and transparent and rules-based procedures? A: I already gave my reply yesterday. The relevant Chinese department reviews the takeover in accordance with the Anti-Monopoly Law. 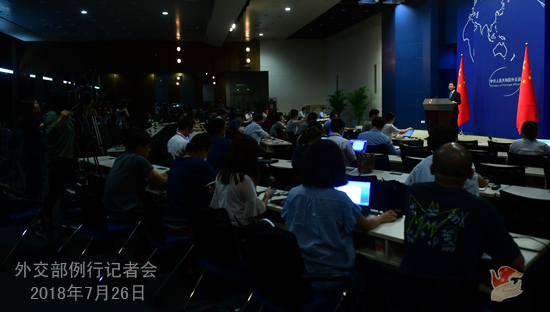 With regard to the so-called issue of openness and transparency, during the reviewing process, the relevant Chinese department has maintained sound communication with Qualcomm. I will refer you to the competent authority for the specifics of the review. 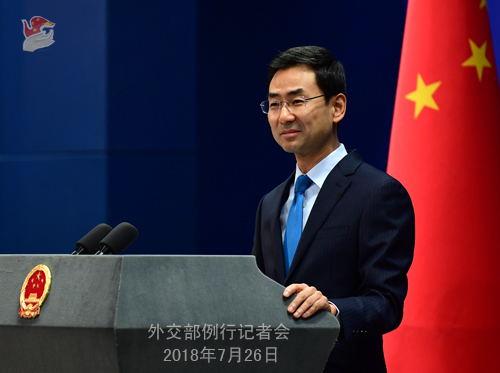 Q: Chinese Ambassador to the United Nations has called for an international peace conference on the Palestinian issue in a open session recently. Can you give us more details on this? A: China's position on the Middle East issue is always consistent and clear. We have all along supported the Palestinian people's just cause to restore their legitimate national rights and their right to establish a state. 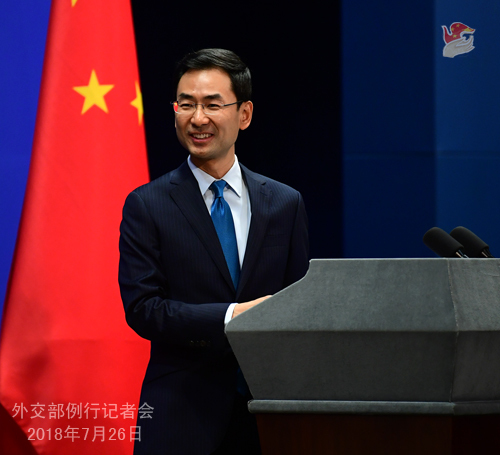 On such multilateral stage as the United Nations, China has actively voiced its support for the just cause of Palestine and Arab states and called for respect and guarantee for their legitimate rights and interests. The Arab states are well aware of China's stance in this regard. Not long ago, the 8th Ministerial Meeting of the China-Arab States Cooperation Forum (CASCF) was held in Beijing. The foreign ministers and their representatives from China and Arab states held discussions on the Palestinian and other issues in the Middle East and reached many consensuses. I will refer you to the joint statement issued by the two sides, which contains an elaborate part on the Palestinian issue. Q: President Trump yesterday accused China of targeting US farmers in a "vicious" way in an effort to get concessions from the trade war. Do you have any response? A: China is the main buyer for US agricultural products. Over the years, China-US agricultural cooperation has continued to grow and deepen, bringing tangible benefits to the two sides, which I should say is mutually beneficial and win-win. You may still remember that last June, China and the US reached consensus on the US beef exports to China. In May this year, the teams from the two sides conducted constructive consultations on the economic and trade issue in Washington, D.C, and they agreed to increase US agricultural exports to China in a meaningful way. All these agreements could have been implemented smoothly, but regrettably, they are not going the way as expected. The US is the one to blame for the current situation, who practices unilateralism and trade protectionism, reneges on the deal and is bent on igniting a trade war against China. The US farmers are paying the price for their government's act of trade bullying. I would like to repeat what I said yesterday: we hope the US side will heed the rational voices from various sectors at home and the call from the international community, get a clear understanding of the situation and think about its gains and loses, and stop drifting further down the wrong path. Q: President Trump yesterday agreed to refrain from imposing auto tariffs on the EU while the two sides undergo trade talks and the EU agreed to buy more US soybeans. The EU and the US seem to come to agreement over trade issues. What's your comment? A: The US and the EU are main economies and trading partners in the world. If the US and the EU can resolve differences over trade through dialogue and negotiation, correspond with the trend of globalization, and promote trade and investment liberalization and facilitation against unilateralism and protectionism, this will serve their interests and be a good thing to the world at large. Indeed, we also hope the relevant efforts and measures of the US and the EU will comply with multilateral trading rules, for example, the non-discriminatory principle. You may also noted that the BRICS Summit is being held in South Africa. The meeting voiced the strong opposition to unilateralism and protectionism on behalf of the developing countries and emerging markets. We hope the relevant efforts and measures of the US and the EU will conform to the aspiration of the developing countries as part of the international community's effort to uphold multilateralism and play a constructive role in promoting global economic growth.